It takes a lot of legwork to organise some of the world’s most invisible workers. My name is Lulu Abdallah Omar and I am 27 years old. I was born and raised in Zanzibar, Tanzania, where I currently live with my grandmother and my grandfather, as both my parents passed away 23 years ago. I studied primary and secondary school in Zanzibar, in a school called Sunni Madrassa. Having done well in my exams, I was offered the opportunity to continue my studies and do A levels. My parents weren’t able to pay for the school fees, so I decided to find a job instead. In 2007, I started working as a domestic worker. First, I worked for an Indian family in Zanzibar: I cleaned their house and took care of their children for five years. Then, I joined a union that advocates for the rights of domestic workers called Conservation, Hotel, Domestic and Allied Workers Union (CHOWADU). It is the only trade union in Zanzibar that deals with domestic workers and it has been registered as trade union since 2001 under the Trade Union Act. I joined this union when my employer stopped paying my monthly salary and the union helped me get the money owed to me from the boss. From then on, I became an active member of CHODAWU and started to help fellow domestic workers who found themselves in similar situations to mine. In 2012, I went to college and got a diploma in business information technology from Zanzibar University, during which I continued to be an active member of the union by standing up with domestic workers and helping them become aware of labour laws and their rights as workers. In Zanzibar, the working conditions for women, and domestic workers in particular, are very difficult. Domestic workers’ rights are violated in their work environment, and are treated unfairly by their employers. They are often treated like slaves, and are denied their basic human and worker rights. Most domestic workers are under eighteen years, which means they leave school to start working. Many of these domestic workers are sent to countries in the Middle East to work, but the majority of domestic workers working in Zanzibar stay in the mainland regions, namely Mtwara, Lindi, Dar-salam , Mwanza, and Singida. As a union leader and a gender coordinator, I have done a lot of advocacy and lobbying for the rights of domestic workers along with other migrant domestic workers in Zanzibar. I have been working with CHODAWU, the Employers Association, the International Domestic Workers Federation, and other international NGOs to push the government to ratify the ILO’s Domestic Workers Convention (C189). I have also been trying to make employers and other communities aware of the importance of creating favorable working conditions for domestic workers, and to encourage domestic workers to join our union for their own benefit. However, this awareness raising process is not easy, given that some of these issues are deeply rooted into the culture of the people and their belief system, and that many people are financially benefiting from the current situation of domestic workers. • Many domestic workers and migrant domestic workers have received contracts with their employees after a campaign we held in 2013 and 2014. Domestic workers have come back to us to say that they have now received a contract according labour law. • Many migrant domestic workers have joined and registered with the CHOWADU union. • Some domestic workers and migrant domestic workers have had the opportunity to sit down together and share their experiences working in Tanzania and abroad. • We were able to establish an association of migrant domestic workers in Oman that shares information with our own union via liaisons. I also established special committees in Tanzania that focus on certain work places. In these ways we work directly with communities from a grassroots level to the national level, in both rural and urban areas. • We can now have peaceful dialogues with employers about domestic workers’ rights thanks to government support. Migrant domestic workers are the most vulnerable group of domestic workers. Often times, those who leave to work in countries in the Middle East have a lot of problems and no one to turn to because they got there through labour recruiting agencies. When they come back home to Tanzania, they often seek help from CHOWADU. We try our best to sit down with them and tell them about their rights and the importance of letting us know if they want to travel to another country, so we could continue having contact with them and sharing information with them through WhatsApp. That way, they also have a way of letting us know if they are in trouble. We currently have about 3,660 domestic workers registered with the union on the islands of Unguja and Pemba, both part of Zanzibar. As members of the union, these workers have access to more information about minimum wage, overtime payments, and have been able to participate in many awareness raising meetings. 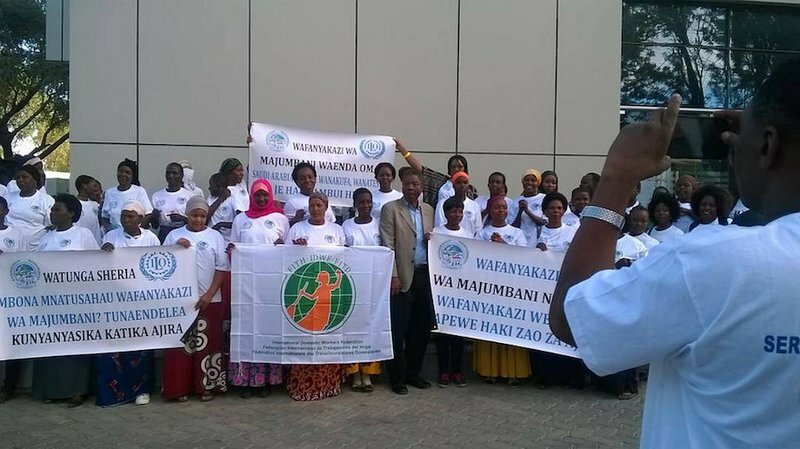 The people of Zanzibar – especially the employers and employees – now understand and take seriously the rights of domestic workers. Indeed, many employers have started changing their attitude and behaviour towards domestic workers.